McDonald’s has upped the ante in the QSR meal-deal game. The Chicago-based chain on Thursday introduced a $6 bundled deal, coming in at $1 more than the recent spate of $5 meal promotions by Taco Bell, Rubio’s, Carl’s Jr., Del Taco, Dairy Queen and Pizza Hut. 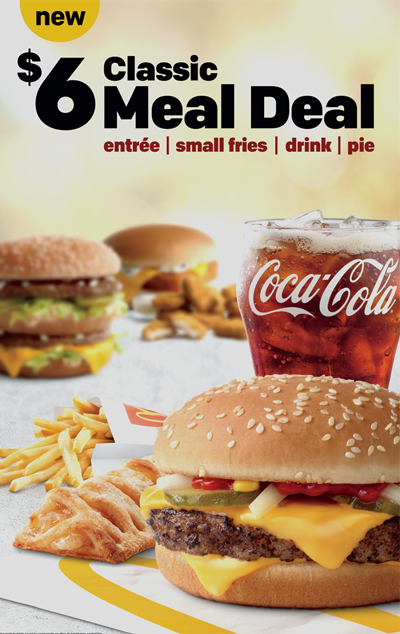 The $6 Classic Meal Deal includes a choice of one of four popular entrée items: Quarter Pounder with cheese, Big Mac, 10-piece Chicken McNuggets or Filet-O-Fish. The four-piece meal, available Nov. 1 for a limited time, also includes any size soft drink or sweet tea, small fries, and an apple pie or seasonal pie. Tim Powell, a senior restaurant analyst at Q1 Consulting in Chicago, said McDonald’s is responding to the $5 box frenzy. But, to protect margins, the chain – which continues to offer a$1 $2 $3 Dollar Menu — is hoping consumers won’t balk at a $6 price point, he said. Still, Powell said there’s a chance that fast-casual consumers might be attracted to a $6 bundle at McDonald’s. But, it seems unlikely. 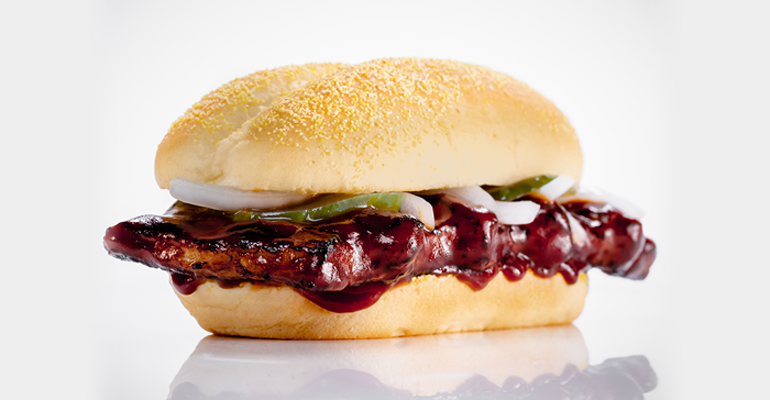 In other McDonald’s menu news, the iconic McRib returned to restaurants this month. The legendary sandwich, whose whereabouts is tracked online by fans, normally appears around the winter months. But it typically shows up in random markets. This year, it is available in 9,000 restaurants across the U.S., as well as via delivery. That reach surpasses the previous year, McDonald’s said. “With the McRib also now available via McDelivery on Uber Eats, we’re excited to make it more accessible to customers with the speed and convenience they expect from McDonald’s,” McDonald’s chef Mike Haracz said in a statement. The McRib is made with 100-percent seasoned boneless pork slathered in McRib sauce and served on a hoagie-style bun layered with dill pickles and slivered white onions. It first appeared at a McDonald’s restaurant in Kansas City, Kan., 36 years ago. The McRib’s return and the $6 combo meal promotion come on the heels of the chain’s announcement of its first new breakfast sandwich in five years. The Triple Breakfast Stacks, which look like a breakfast version of a Big Mac, were introduced to reinvigorate sluggish breakfast sales. The double meat, double cheese and egg sandwiches are priced at $3.89 each. That’s over a dollar more than Taco Bell’s most expensive breakfast items, the Breakfast Crunchwrap and the Grande Scrambler.